A brief intro. The Wild Places is a small label run by one Michael Piper, a big lover of progressive rock in general and the Swedish prog/psych music scene in particular. As you can see from the number, there’s not a lot of releases, but I can vouch for the fact that all of it is excellent. 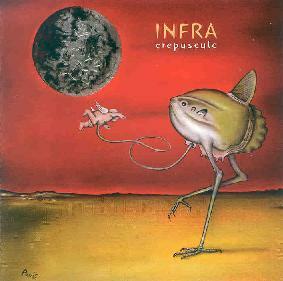 This is the 3rd CD from Infra and features the playing of: Victor Alneng (bass, vocals), Mikael Ludvigsson (drums), Frans Perris (guitars, vocals), and Filip Torle (cello). The tracks are a modern take on the early 70’s psychedelic-turning-to-progressive sound. There are also a number of Alternative references. I knew I would like this CD, so I’m actually biased. I wasn’t sure what they would play, but I knew it would be very well done. I’m not disappointed. The tracks are all in the 5-9 minute range except for one long track at the end. Whispery vocals, electric sitar, strings provided by a cello, intricate instrumentals, I’m not exactly sure what else I would want from this band. I’m satisfied. If you like the music of Sweden, bands like Landberk, Anekdoten, and Anglagard, you will really like Infra. While sounding nothing like these bands, Infra’s attitude, ability, and craft puts them firmly in this group. Highly recommended. For more information you can email The Wild Places at: aceofdiscs@aol.com.